Scan the World's DNS resolvers to locate those best for you. 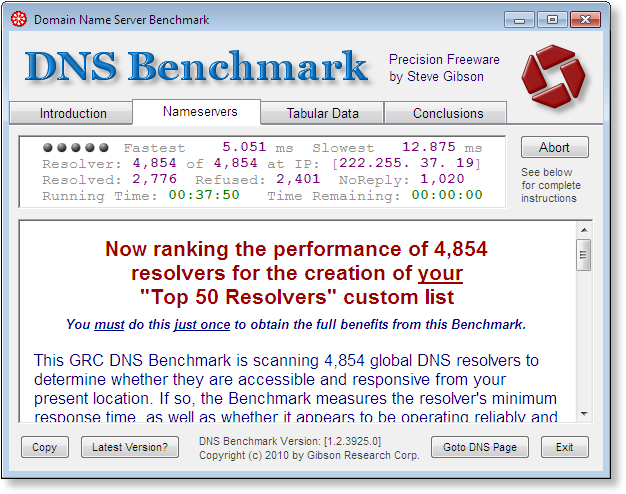 Version 1.1 of GRC's DNS Benchmark added the major new feature of rapidly scanning a global master list of nearly five thousand (4,854 at the time of this writing) known potential DNS resolving nameservers and building a fully customized list of the top 50 fastest responding resolvers. This "fastest 50", which would be much more relevant for each individual user, would replace the Benchmark's default built-in list. Our experience with this approach has been a tremendous success. Every person who has built a custom list has discovered DNS resolvers that are faster than any they had previously known existed. The three factors that most affect the delivered performance of a remote nameserver are the nameserver's overall speed, the network distance separating your computer from the remote resolver, and the intervening network's congestion at the time the DNS query is made. Of these three factors, experience has shown that network distance outweighs everything else. This fact argues for the benefits of locating the DNS resolvers that are geographically nearest to the computer(s) whose DNS access you are interested in optimizing. Since GRC's DNS Benchmark will be used across the entire Internet-connected planet, the Benchmark's built-in default United States-centric DNS resolvers would be useful to residents of the US, but far less useful to users in other countries. What's more, extensive testing has shown that even within the United States it is possible to locate and identify useful DNS resolvers that are much faster than any of those supplied by the built-in default list. As you can see from the picture of the dialog above, the dialog's buttons allow you to start the custom list building process (which will require about 37 minutes to complete), skip the custom building, or learn more about building a custom list. 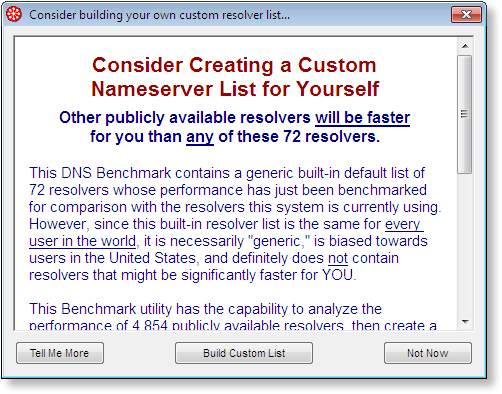 In addition, both the Benchmark's System Menu, and the Add/Remove Nameservers dialog, offers options for building or re-building the custom nameserver list at any time.